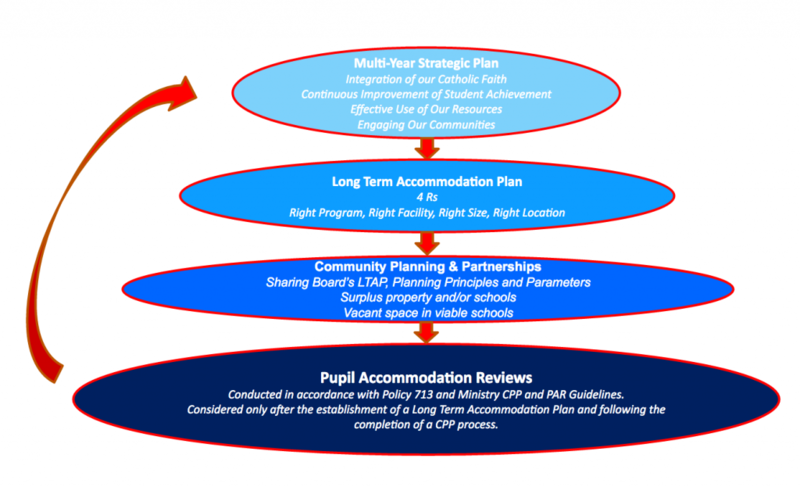 The York Catholic District School Board has identified possible Community Hub and Facility Partnership locations for future planning and community consultation as per its Policy 704 Community Planning and Partnerships. A list of schools has been developed and can be found on the tab below entitled, List of Potential partnership/co-build opportunities. Be respectful of the tenets of our Catholic faith. Any applicants deemed not to meet the eligibility criteria will be notified and will not proceed to the Board for approval. Administration is currently evaluating the community partnership applications submitted in the 2017/2018 school year consistent with Board policy, operating procedures and the MYSP. Potential partnership opportunities will be subject to consultation with the affected school communities. To date, no decisions regarding community partners have been made by the Board. Questions regarding the YCDSB’s Community Hub initiative can be made to Tom Pechkovsky, Coordinating Manager of Planning and Operations at 905.713.1211 ext. 12374. The purpose of the ถ่ายทอด สดยูฟ่าคืนนี้Ministry of Education’s Community Planning and Partnerships (CPP) Guideline is to encourage school boards to reach out to community organizations to share planning information on a regular basis. Those marked with an asterisk (*) have been identified as priority community hub locations. Space availability is subject to the number and type of partners in a location.? Space may have the ability to be expanded in the future based on school enrolment. The “Available space for partnership” is estimated based on an average classroom size of 750 sq. ft. times the number of available classrooms at each facility.? More in depth analysis will be completed on a case by case basis to determine exact square footage available should a community partnership be pursued. *Pending Ministry of Education funding approval.